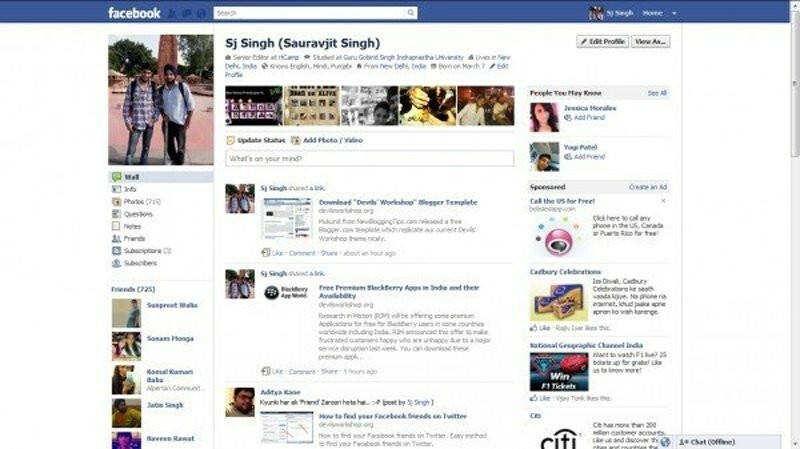 When Facebook first launched its News Feed 10 years ago, users went bananas. They absolutely hated the change. It was the most "inglorious launch moment in history," says Chris Cox, current chief product officer and one of the early Facebookers who worked on the first iteration of the format. It would also end up changing the way that we use the internet. 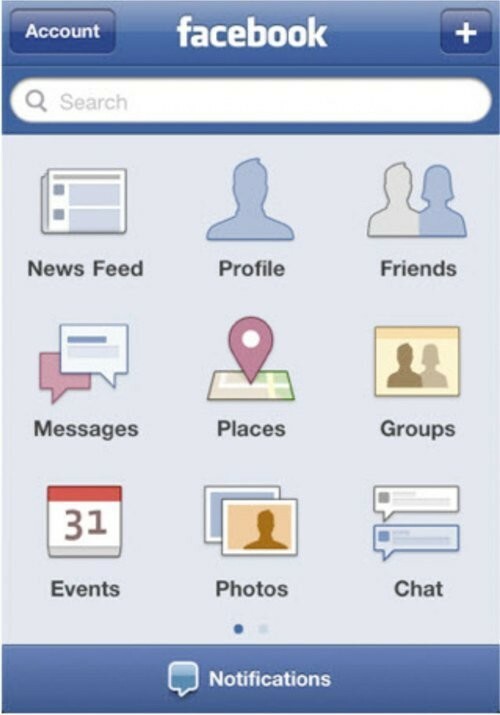 Before the News Feed, you wouldn't see a collection of updates and stories when you logged onto Facebook. You'd only get personal notifications like how many people had 'Poked' you and if anyone had written on your Wall. Every browsing session was like a click-powered treasure hunt: You would search for specific people to look at their profiles and then just wander through the site from there. Most people won't remember what that was like: At the time of the change, the social network only had 10 million users, compared to its roughly 1.71 billion monthly active users now. Their champagne popping felt premature when unhappy users and reporters swarmed outside the office the next day and Groups protesting the change swelled to millions of users. 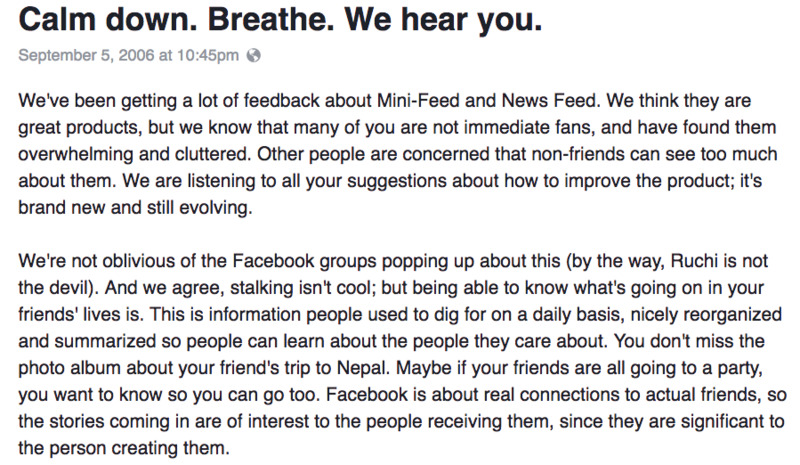 Ironically, the coordination of the galvanization proved to Facebook execs that the New Feed was actually working. It would have previously been much harder for people to unite with strangers around a cause. Ultimately, users were spending much more time on Facebook and connecting with other people in ways they never could before. With a ten year lens on that disastrous launch, it's clearer than ever how the News Feed changed much more than just Facebook. It was the first real social feed. 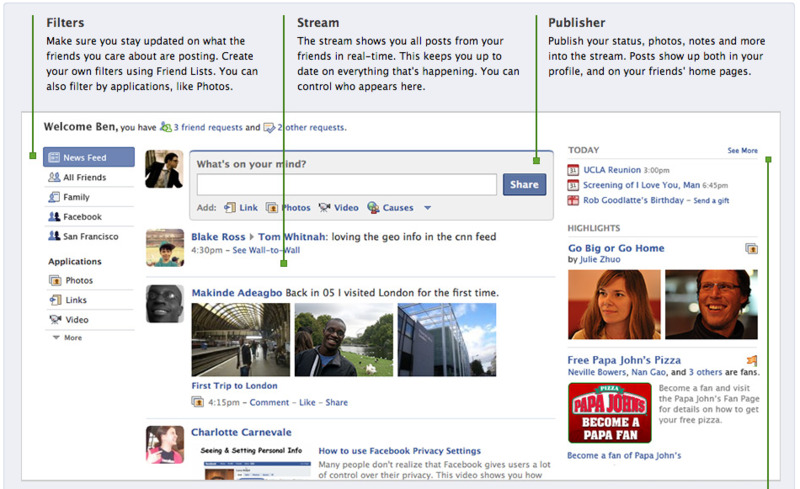 Today, most social networks use some similar form of a live-updating central hub of content. The concept of a filtered stream of social content feels so basic now, but at the time it looked revolutionary. It has also given Facebook an unprecedented amounts of power over people's digital lives. The creation News Feed is what has made Facebook one of the biggest distributors of information in the world. Despite Zuckerberg's displeasure at having Facebook called a "media company," it serves news to more US adults than any other social network. That makes its ever-changing algorithm extraordinarily powerful: The average Facebook user has 2,000 different stories that they could potentially see every day, but they'll only end up seeing about 200 of them. "We're constantly trying to get a better understanding of what our community finds valuable and what it doesn't," Zuckerberg writes in his own anniversary post . First there was "The Facebook." 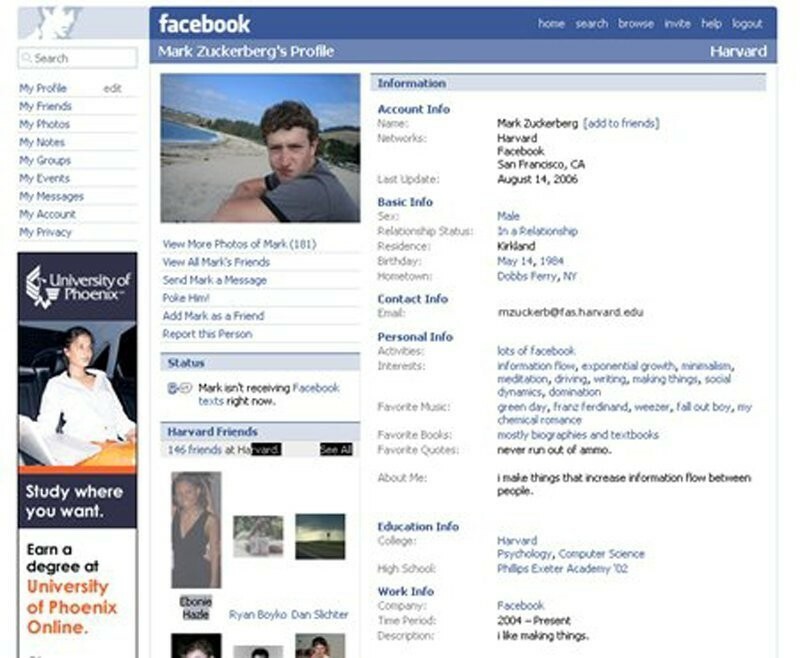 The social network started at Harvard and slowly opened up to other colleges. 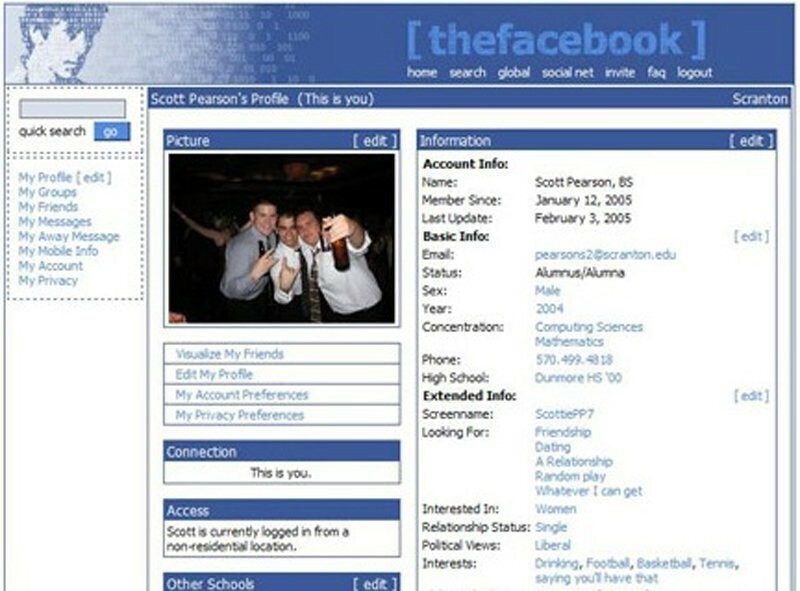 The company decided to drop "the" from its name in 2005, after it bought the domainFacebook.com for $200,000. 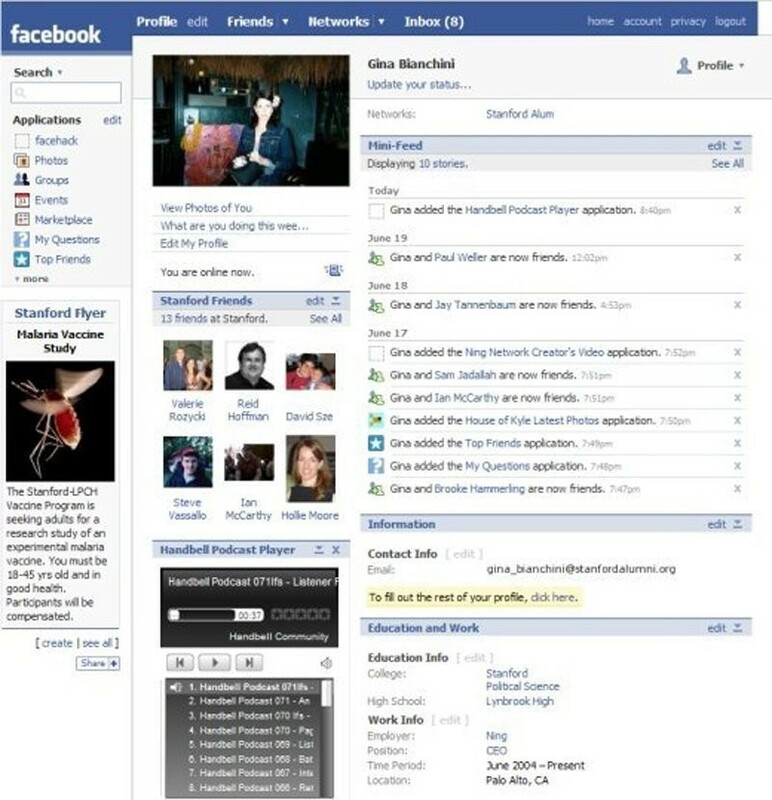 Back in 2005, before the News Feed launched, Facebook was essentially just a collection of disconnected profiles. Then, the News Feed happened. 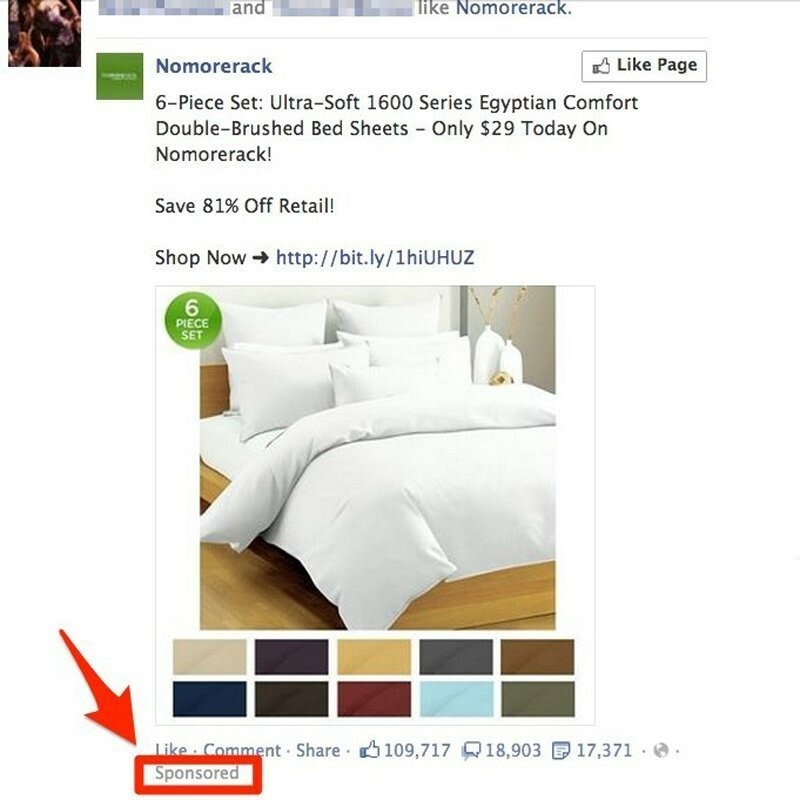 At the same time, Facebook introduced the Mini-Feed. But the entire concept of a News Feed resulted in some very public outrage. Some users even went so far to call product manager Ruchi Sanghvi the devil. The panic spurred Zuckerberg to pen this post reacting to the reaction. Check out his profile in 2006. 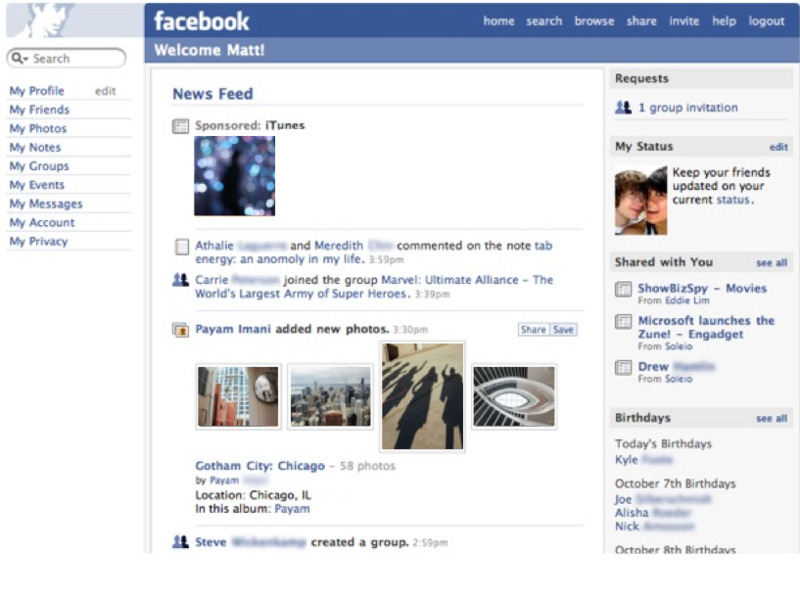 In 2009, Facebook's home page got a face-lift. 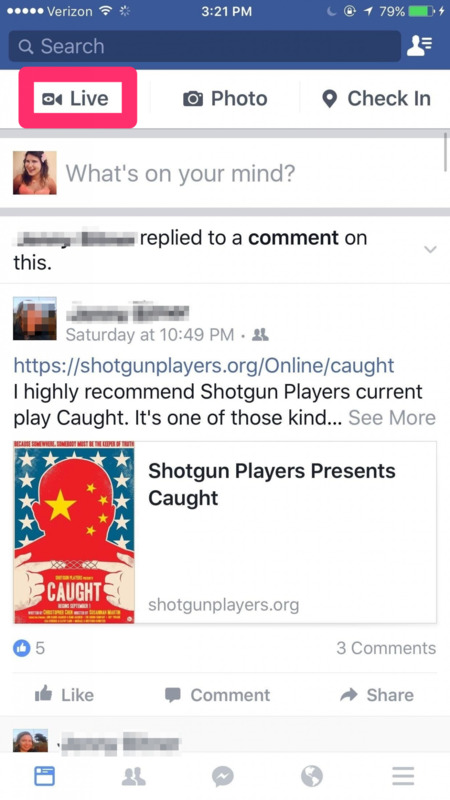 Posts started to stream through the News Feed in real time (previously it took stories 30 minutes to appear). 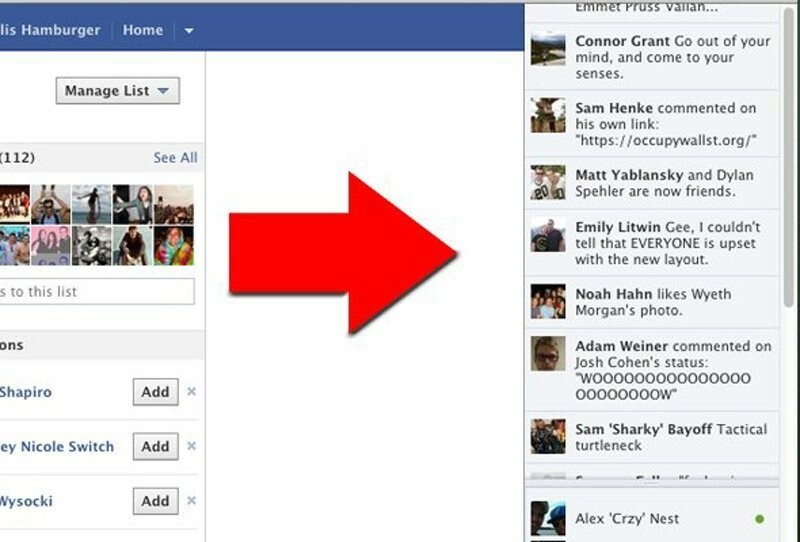 In 2010, Facebook brought notifications to the top navigation bar following yet another redesign. 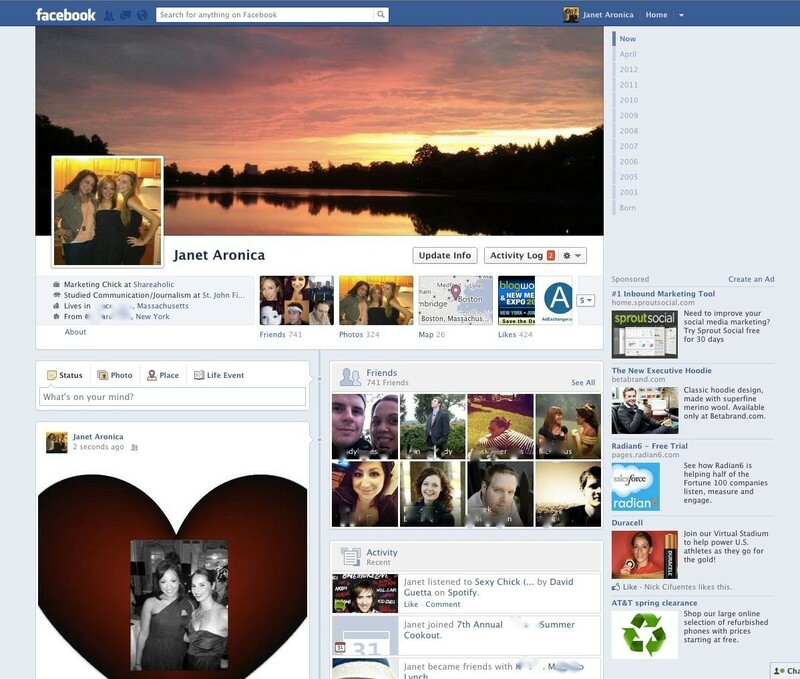 It also rolled out a new, more visual profile in 2010. 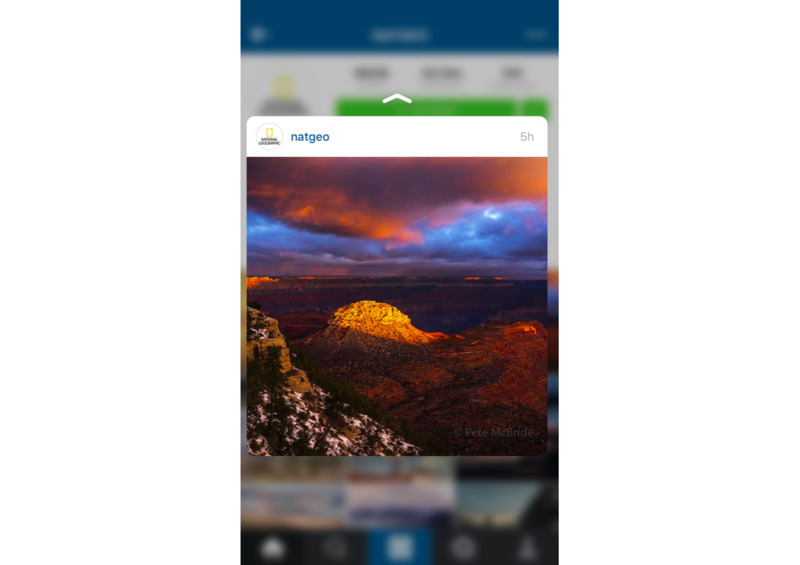 It added a row of recently tagged images below your name and basic profile information. 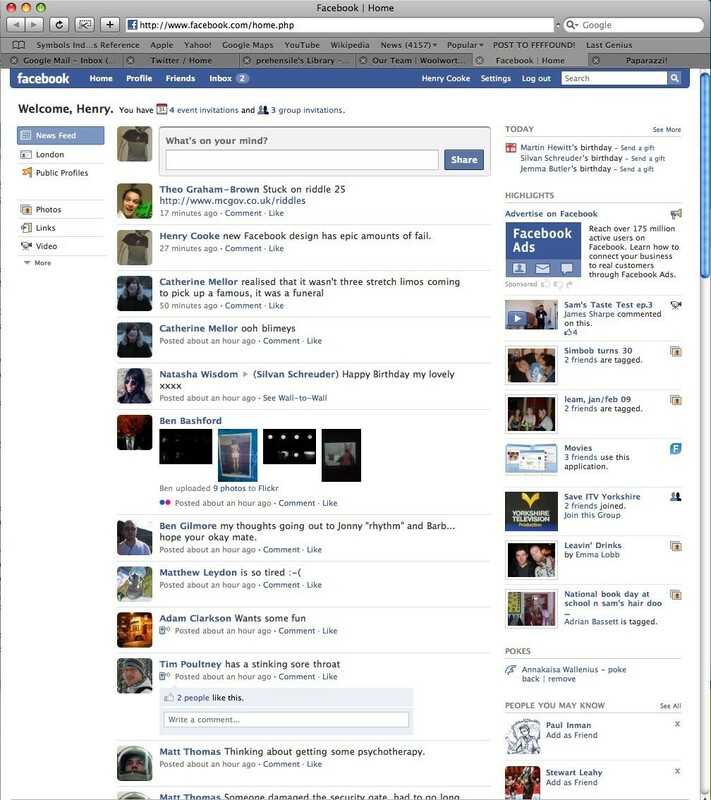 The Facebook Timeline feels like it's been around since the beginning. But it actually launched in 2011 to act as a virtual timeline of your entire life. 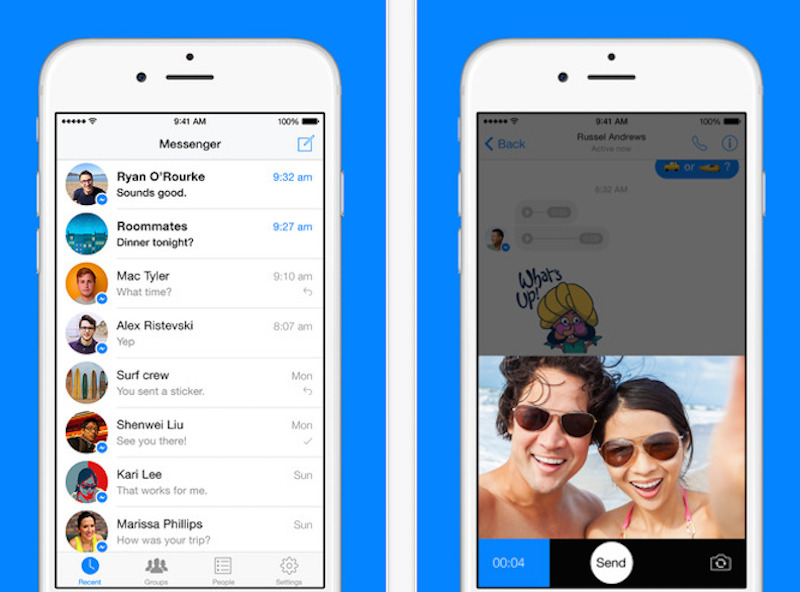 Facebook split its instant-messaging into a different app called Messenger in 2014. It's now got more than 1 billion monthly users. Facebook also owns a bunch of other popular apps, most notably Instagram, which the company bought for $1 billion in 2012. With more than 500 million monthly users, that seems like a steal nowadays. 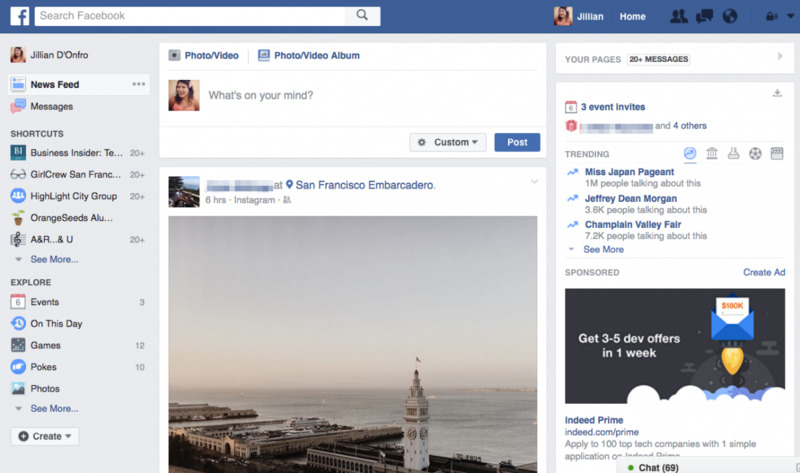 Here's what Facebook's News Feed looks like today.